Have you ever needed to have a difficult conversation at work? You know the one where your coworker might have touched your hair without permission, and --being that it's 2019-- you were left standing in shock not knowing how to address it? Or a colleague or manager has said something disparaging about you or your work that you know isn't accurate? Lastly, maybe you remember a time where you had an idea in a meeting and one of your colleagues continued to talk over you. You left that meeting thinking to yourself, "I should have said something." Navigating difficult conversations at work is not easy, but is necessary. It must be done with finesse to avoid someone calling us "angry," "excited," or "emotional," but we must be our best advocates in addressing disrespectful interactions, or how else will our colleagues learn what is appropriate and acceptable? Here are a few tips to help you with your comeback when some of your colleagues might have lost their mind -- it's up to us to help them find it. 1) Prepare. I once heard a black woman say--she always has a "comeback" ready. I asked her to explain what that meant. And she frankly said, "There will always be someone at work that says something out of pocket to you, especially if you are the only one or one of few in the workplace. So I always have a comeback ready." She admitted that it took years for her to build up her courage to address bias and microaggressions in the workplace, but at some point, she said, she couldn't let them slide anymore. So she prepared statements ahead of time to help her address these occurrences and she felt so much better doing it. It helped her not have to replay woulda, coulda, shoulda moments after the fact. Try practicing your comebacks with tact like Issa Rae in the mirror on episodes of Insecure. 2) Learn to be Direct. This is a good opportunity for you to pull "Bob" over after a meeting. For example, "Hey Bob, can I talk to you real quick? I noticed in our meeting that you continued to talk over me when I had something to say. I realize you probably weren't doing it on purpose, but I wanted to make you aware of it for next time. Thanks for understanding." You have ideas and a perspective that needs to be heard and your voice will never be heard if you allow others to silence it. Yes, this isn't an easy conversation to have with "Bob," but part of securing our seat at the table is learning how to navigate hard conversations at work. P.S. It's not always what you say, but it's how you say it, so this conversation can be delivered better than Bruno Mars and his finesse. 3) Have The Receipts. Starting out in the workplace, I'd often hear the advice from mentors, "Document everything." This is so helpful, especially when a boss or colleague has said something about your work that you know to be untrue. Perhaps they said you didn't deliver something in the way you were asked to. Go back through your notes! Then when you have that difficult conversation, you will be armed with facts -- dates, emails, work submitted -- that you will contribute context to situations where otherwise it would be your word against theirs. 4) Know Your Value. Oftentimes, we don't want to make waves. We want to keep our heads down, do our work, and avoid confrontation altogether. Of course, every little thing isn't worth bringing up, but others are. Think -- "If this happened to my best friend, would I be ready to fight for her? Would I encourage her to speak up for herself in this instance?" Know that you deserve to be respected at work. Treat yourself like you would your best friend, and be your own best advocate! April 2nd is Equal Pay Day for Women. We know that all women do not make the same for some of the same jobs--but if we keep negotiating and asking, our hope is to get closer to dismantling the wage gap. Recently, Payscale.com released a report and the discrepancy in pay as it pertains to women of color was simultaneously heartbreaking yet not not surprising. Check out their comprehensive report here. My mother first taught me about managing up. That isn’t what she called it, of course, but when I got my first job, she’d tell me stories about her career. She'd share how she went from working in the basement at her company to getting promoted to a number of different roles, and the little things she did to get there. She'd regularly give me suggestions on how to be great at work, and how to get the most done with (or in spite of) whatever boss I had. If you have followed some of the commentary on social media around Black History Month, you may have seen many folks calling for a do-over (with all the atrocities taking place from Gucci to Virginia and beyond). And even though a lot of jaw-dropping moments have taken place, it doesn’t take away from all the amazing accomplishments of women of color so far this year--like Kamala Harris running for President or Rosalind Brewer joining the board of Amazon. And maybe you have hit a goal or received a raise this month, those accomplishments are just as notable! 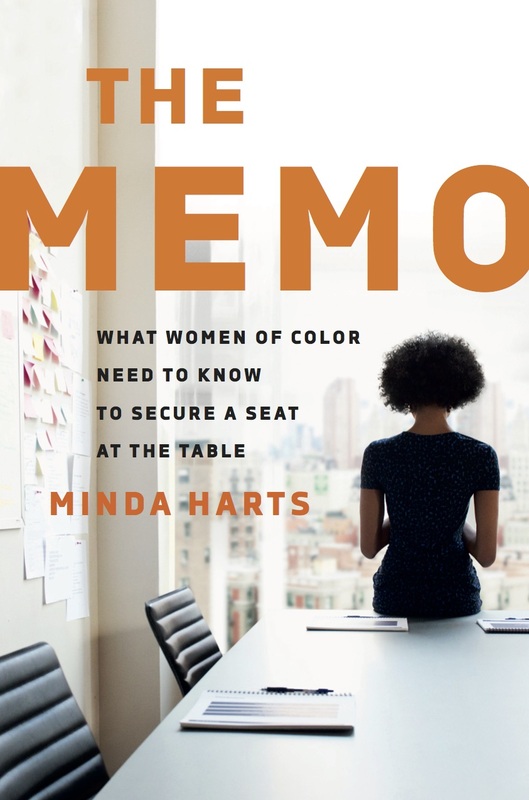 One accomplishment that I want to share with our community is that my upcoming book The Memo: What Women of Color Need to Know to Secure a Seat at the Table by Hachette Book Group is available for pre-order. The Memo is the much-needed career advice guide for women of color specifically, ending the one-size-fits-all approach of business books that lump together women across races and overlook the unique barriers to success for women of color. I have written a lot about issues that women of color face in the workplace and I am excited to expand the conversation beyond just our Monday Memos. Many of our ancestors were not permitted to learn to read and write, and I feel so blessed to have the opportunity to write a book that sheds much-needed light on how women of color and black women experience the workplace. My book debuts on August 20th and I hope you would consider purchasing one for yourself, your friends, and your team. This book provides a roadmap to help women of color and their allies make a real change to the system. Let’s continue to make history all year long! What would it look like if you increased your salary this year? Well, we don't want to keep you from the secret sauce, so we are going to let you in on some tips, events, and information to get you ready. 'Tis the season for a list, and we're using the last day of the year to honor those women of color that made us proud in 2018. We are in awe of all the contributions that women of color made this year and every year. This week, we salute five “sheroes” who inspired us. Their contributions are vast, and we know we could not do all of their accomplishments justice, so we are sharing just a few facts about each! Thank you, ladies, for continuing to push us forward! It's almost the end of another year, and we have so much to be thankful for. Thank you to our community for riding with us all year -- for sharing articles, for attending events, being part of the conversation, and working to secure your seat! I have come to terms with the fact. that I will never be “Beyonce," and I will always be a “Kelly”. And I am cool with that--Kelly got coins and access to any room she wants. She is successful in her own right and has secured her seat. As a child you are always told to love the skin you’re in and be yourself. As you get older--adults, your peers and life experiences start to chip away at your self-esteem. As we're thinking about the upcoming new year, it's only natural for us to take inventory of our successes and lessons from this one. On Friday, we hosted our monthly #memocareerchats on Slack -- we took inventory of the year, celebrated our successes, inventoried our lessons, and also discussed good books we read! We first met Elena Valentine--Co-Founder of Womxn of Craft & CEO of Skill Scout--in the Civic Accelerator (CivicX) during one of our sessions in Chicago. Elena was a former participant in CivicX and came back as a successful alum to speak to the next cohort. From day one Elena was transparent and willing to help, which is something you don't always find in other women. But, don't take our word for it--find out for yourself why we think she's dope! This weekend, I was thinking a lot about how far I've come along my career path. The person I was at the start of my career almost wouldn't recognize the stronger, more resilient professional that I am becoming. I thought about those situations in my life (personal and professional alike) that, while in them, felt impossible to get through or to let go of. But each of those situations helped to clear a path forward to where I am today. Now, I hope that I don’t have to put together a full-on powerpoint presentation on why you should vote in the upcoming election on November 6th: if Kanye West alone hasn’t swayed you, then I don’t know what else to say. The good news about voting is that we get the opportunity to decide what side of history we want to be on, and we get to have a voice in what issues matter to us. California Love: Which Way To My Board Seat? What would it look like if the rooms we walked into or the tables we sat at were diverse? What about in terms of board membership? Imagine sitting in a boardroom that was representative of the communities you live in and the customers you serve. I believe that is exactly what California is striving for in trying to pass a bill that would require publicly held companies to have women on their boards. Which is great news for women of color: we are not equally represented on corporate boards, so there is lots of opportunity and board seats to secure. We love celebrating women of color that are doing amazing things in their careers! A few years ago, we interviewed Tenia Watson, Supervising Producer for The Real. We talked risk taking, inspiration, and support systems.